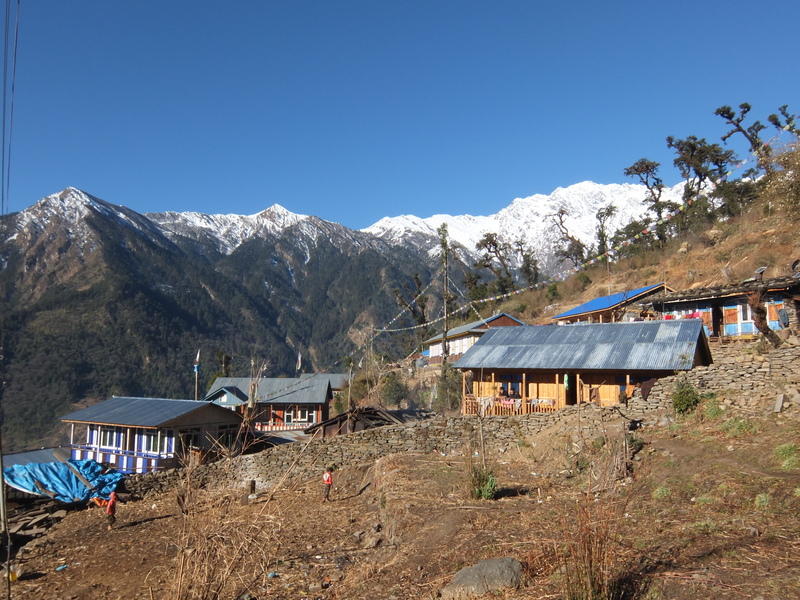 The Tamang Heritage Trail in Langtang National Park slightly differs from both Langtang and Annapurna in that the sheer size and immensity of the surrounding mountains is not the chief attraction. Rather, as the name suggests, the heritage trail takes you through a series of small traditional villages. Classic stone built houses, subsistence agriculture, hot springs, and only a few guesthouses and homestays in each location. To avoid the crowds this is definitely one to consider. During our 4-day stint on the trail we only came across two other people (mind it is low season) the entire trek. This guide will serve as a quick reference for walking times, places to stay, main attractions, and average costs throughout the 3-4 day trek. 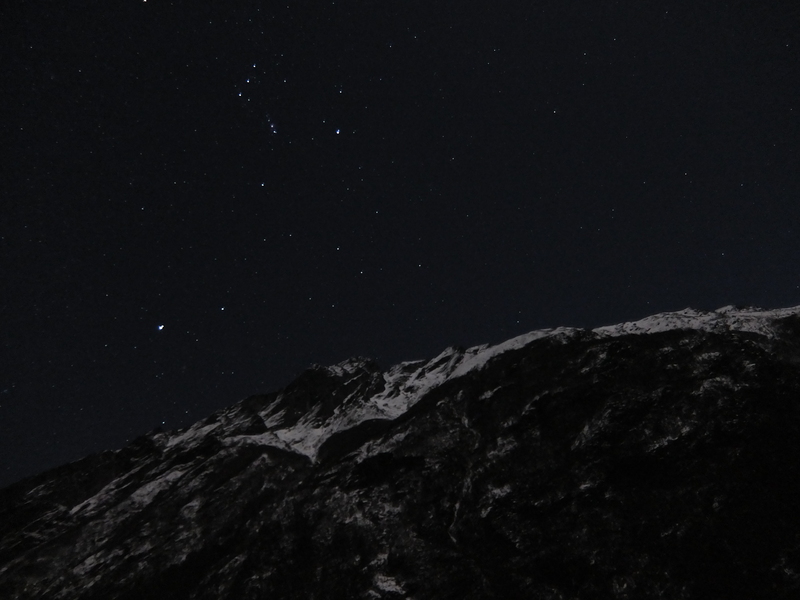 ‘Besi’, as it’s commonly termed among travellers is the jumping off point for two of the three main trekking routes in the Langtang region (Gosainkund can be started in Dhunche). Basically every building on the strip is a guesthouse, hotel, homestay, or lodge. This is a good place to stock up on chocolate, granola, and any last minute down or fleece gear. 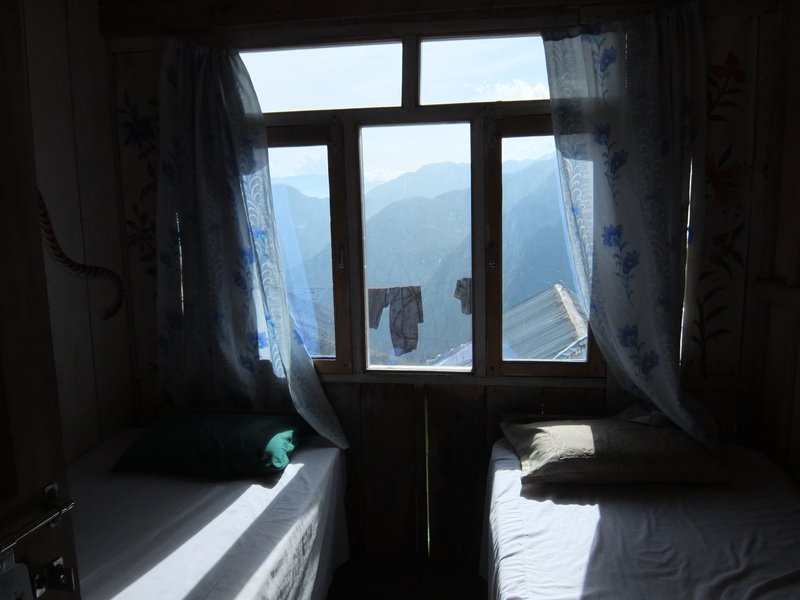 Although there are a lot of options for accommodation we found “Hotel Tibet” to be the friendliest and the cheapest. Hotel Tibet: Accommodation could surely be free here, but the 50rp charge/person is cheap enough that I didn’t even bother. Dal Baht costs 235rp and comes loaded with good veggies and a delicious potato curry. This modest accommodation offers free wifi, free charging, and although there’s no stove this family run operation is always filled with warm smiles and the friendliest dog you’ve ever met. Besi to Gatlung starts with a quite a steep incline to warm you up. Consistent small switchbacks lead you directly up from Besi to the small town of Gojung. 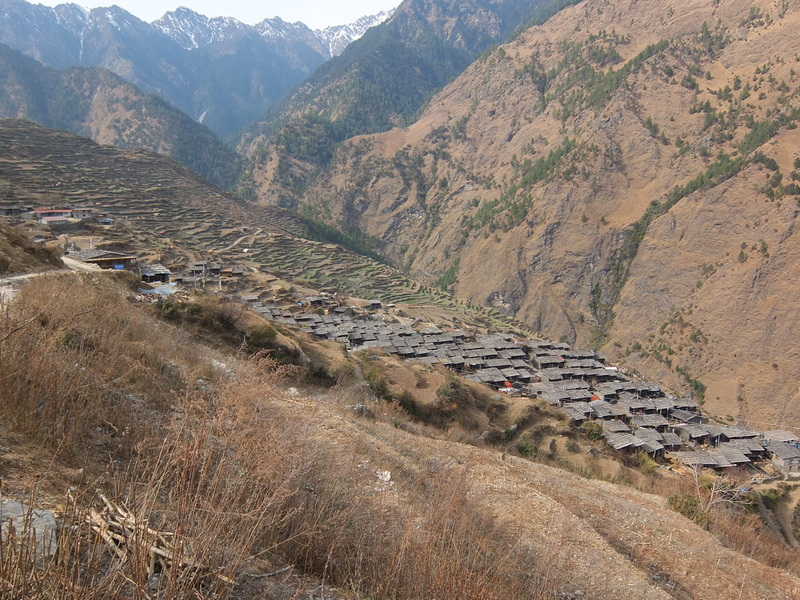 Following the road for 200m you’ll come across a small trail that heads north – taking this trail will lead you to a small dirt road that leads directly to Gatlung. The rest of the day is fairly flat and simply continues along this dirt road. 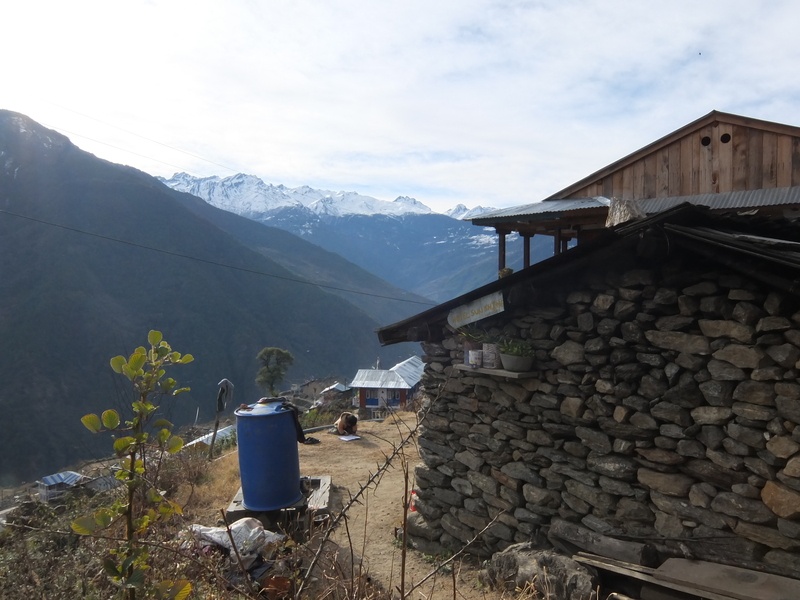 Gatlung is a small village comprised of sloping stone houses and tin roofs. It’s worth taking a walk around town as you’ll arrive pretty early. The town features 2 Guesthouses & 1 Homestay. 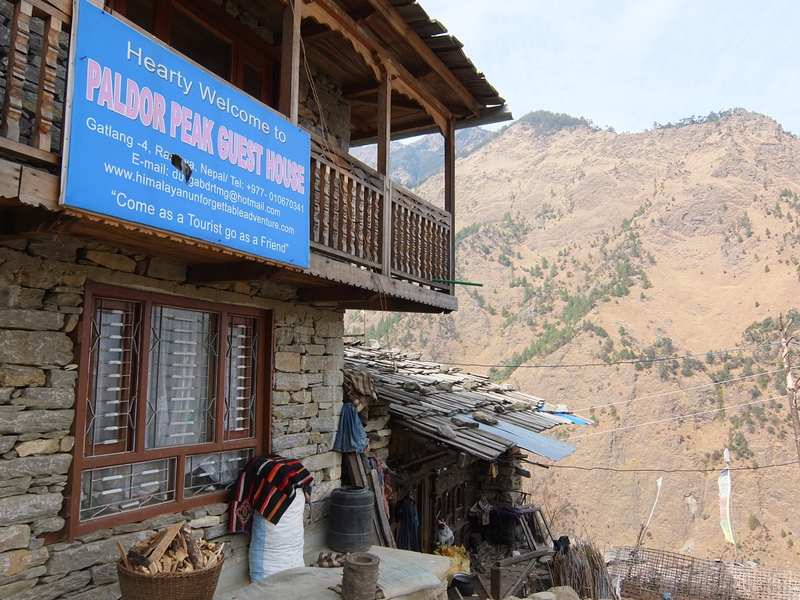 Paltor Peak Guesthouse: Accommodation is free is you’re eating dinner & breakfast (otherwise it’s 250rp for a double). There is electricity running to the building so charging is free. Includes a stove. Total cost with dinner, tea, and a small breakfast was 715rp all in (during the low season). Although the man may appear to a little grumpy at first, once you order some Dal Baht he warms up to you quite quickly. 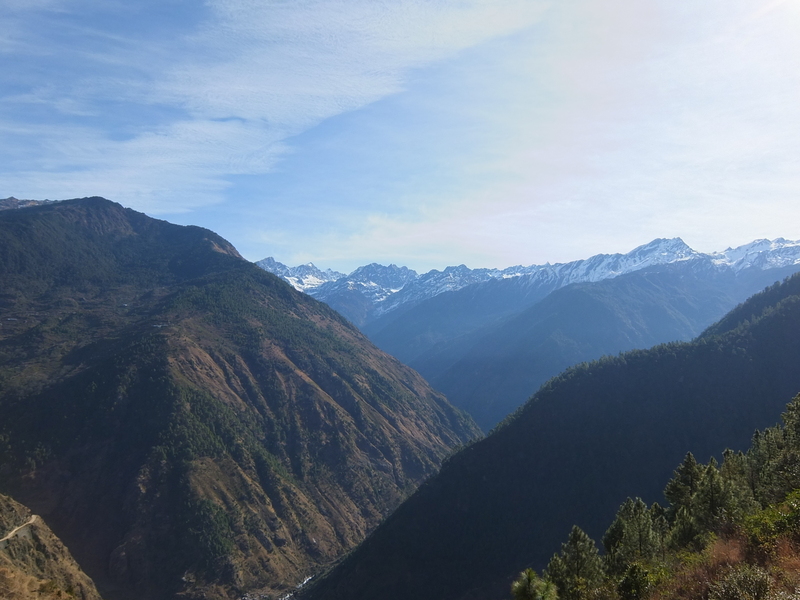 Unlike your previous day you’ll begin this trek with a descent down to about 1500m, which should take you about 1.5 hours. Simply following the dirt trail will lead you to the small village of Chilime, here find the stone archway and turn right along the trail that follows. The next 2 hours are a gradual ascent through farming plots and along a mountain side that affords views of Paldor Mountains, as well as a Chinese hydroelectric project in the works. 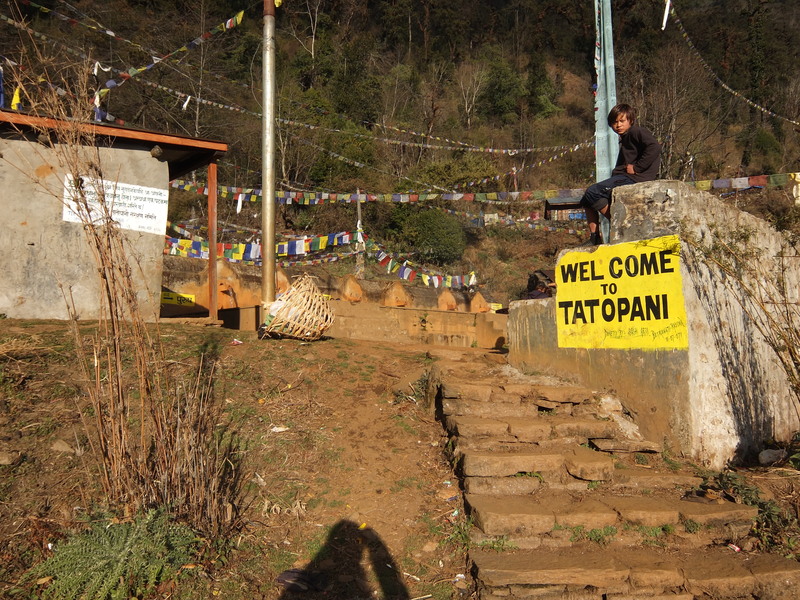 The final leg is a steep ascent for roughly 450m that takes about 1.5 hours and brings you directly into the beautiful village of Tatopani. 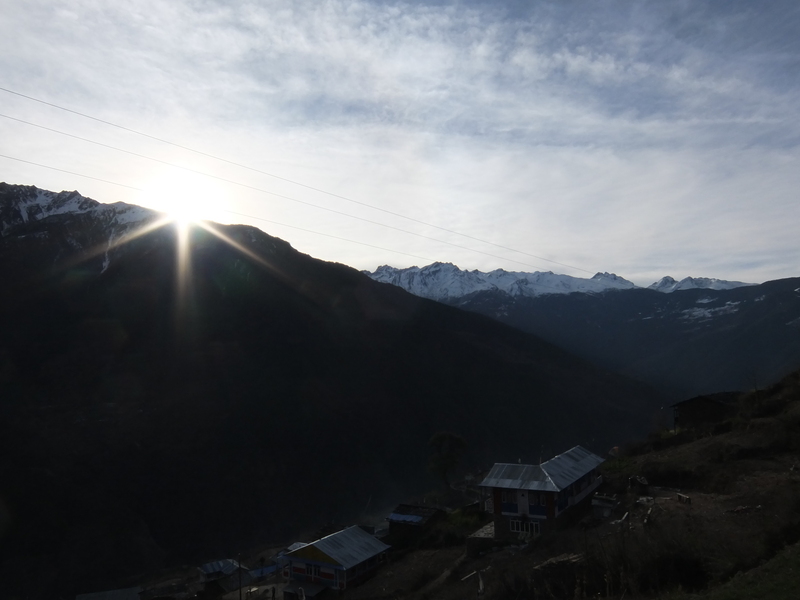 The small strip of Tatopani offers pristine views of the valley below, mountains above, and has a reputation for being quite a spiritual place. 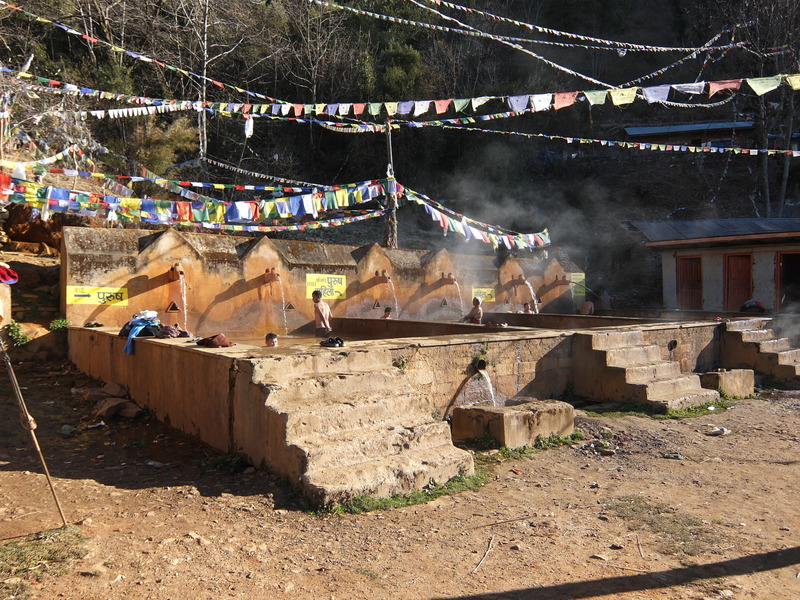 In fact, some Tibetan people pilgrimage for 3 months simply to bathe in the Hot Springs that are nestled right at the top of this town. That’s right, you heard correct, there’s no need for a hot bucket showers here, as a boiling stream of water flows into a series of 3 large bathtubs for you to enjoy. Buddha Guesthouse: As with basically everywhere while trekking in Nepal, if you eat a couple meals here the accommodation is free (otherwise it’s 400rp). Dal Baht runs 400rp. Charging is free, there is no stove and all in the cost the next morning was 675rp. This is the day that truly makes this trail worthwhile. Starting out from Tatopani you begin an increasingly steep ascent for about 1 hour to what appears to be the Ganesh Himal Langtang Range lookout. 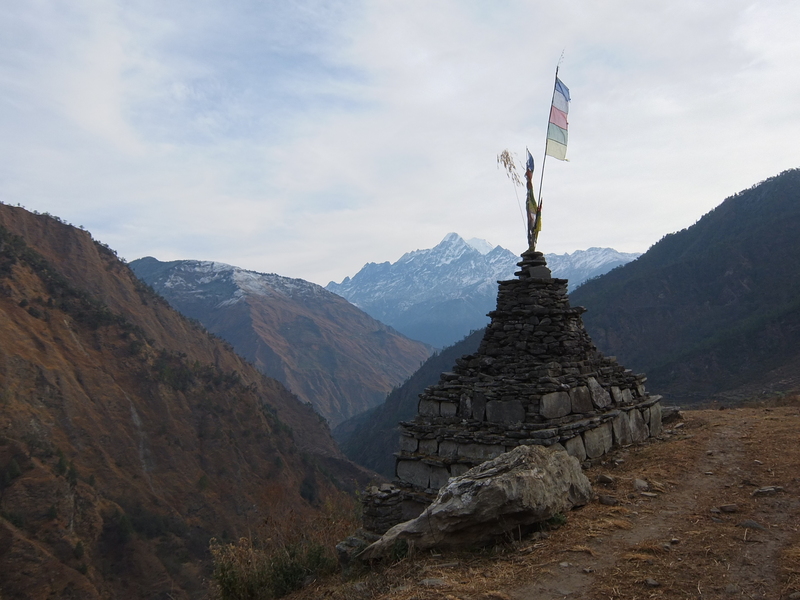 However, after reaching this lookout (which is marked and covered in prayer flags) it’s clear to see that there’s a much more impressive viewpoint higher up the mountain. Continuing up a steep dirt path littered in switchbacks for another hour you’re brought to an altitude of 3300m and an absolutely breathtaking 320 degree view of the Himalayas in both Nepal and Tibet. The immensity and sheer volume of studded rock faces, and snow plastered peaks is enough to draw a few tears – it’s definitely worth spending some time up here. 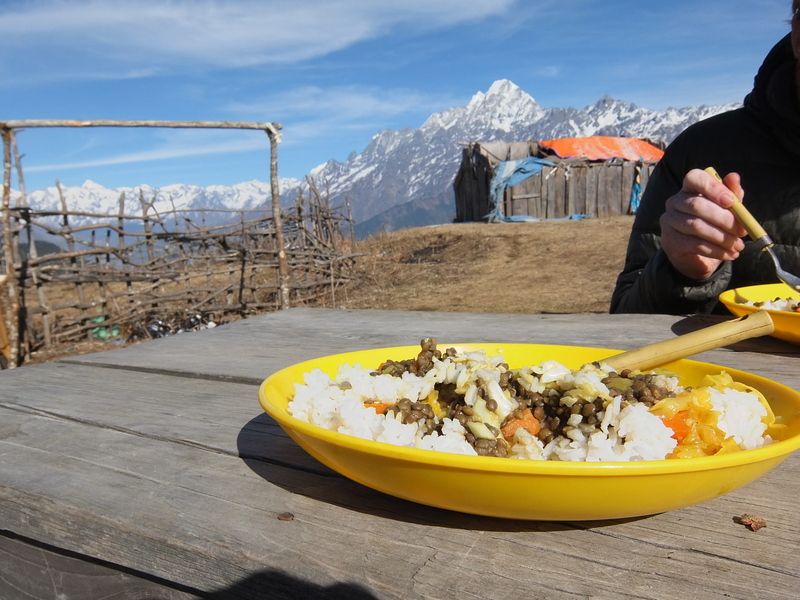 In fact, there’s a small guesthouse on the summit that whips up an amazing Dal Baht for 300rp (Bargained down from 380rp). The rest of the day is a knee-buster with a fairly steep descent for the next 1.5 -2 hours leading you directly to Thuman. This small town consisting of traditional stone homes and great sunset views is tucked right into the mountainside. It could be worth taking a walk around however, we simply got settled in, enjoyed a Dal Baht, sat around the fire and dozed off early. 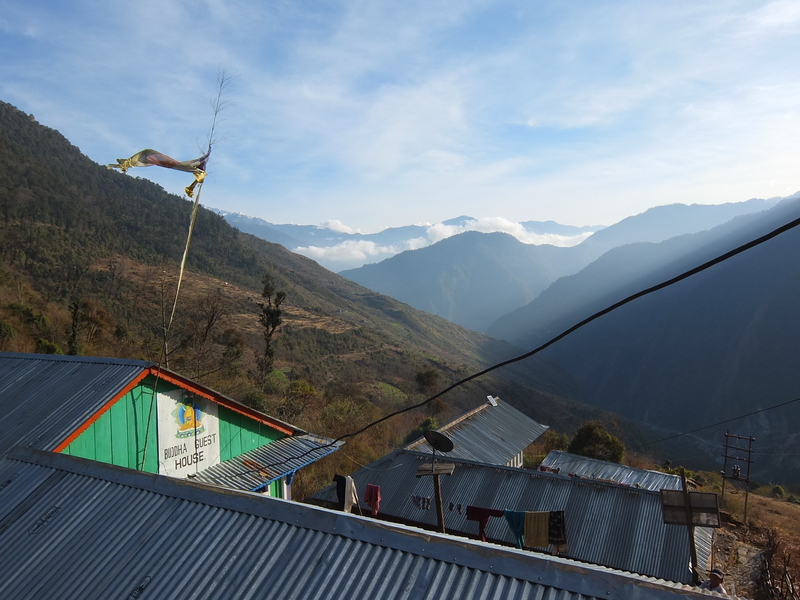 There are a few options for guesthouses and homestays in the area, we chose to stay at the first one we came across due to a convincing 7-year old girl. Sunshine Hotel: Again, free accommodation with purchase of meal. Dal Baht goes for 300rp, charging is free, there is a hot stove inside the dining hall, and the owner is incredibly friendly and accommodating, as is his young daughter who clearly relishes the chance to converse in English to anyone. Cost in the morning was 620rp. Definitely the least scenic part of the trail. 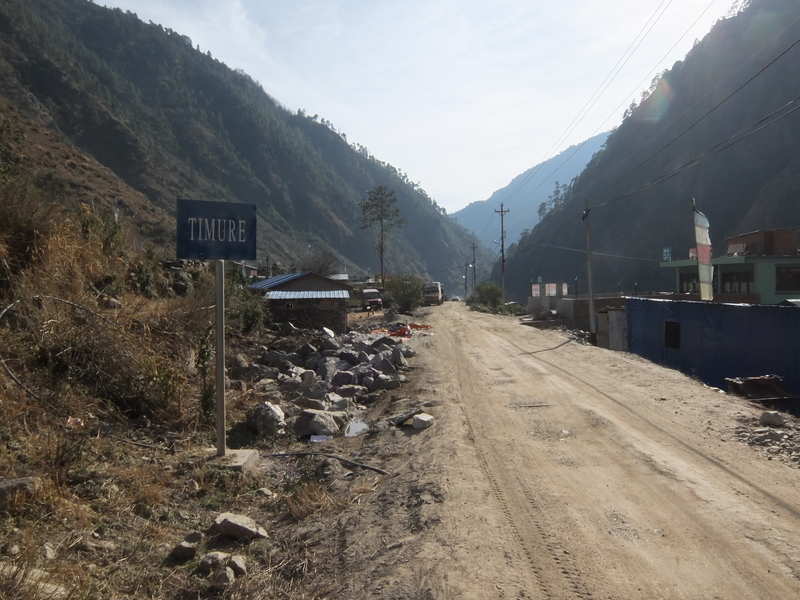 Trekkers have the option to head directly back to Syabrubesi, connect to the Langtang Trail, or head North to Timure and check out the border (of which you’ll unlikely be able to pass through!). The day begins with a steep descent for roughly 2.5 hours, however for those with prior knee injuries this could easily become a 4 hour journey. From Timure the border crossing is a 40-minute walk along the road one way (we opted to wave the hand and cruise in the back of a pickup truck). 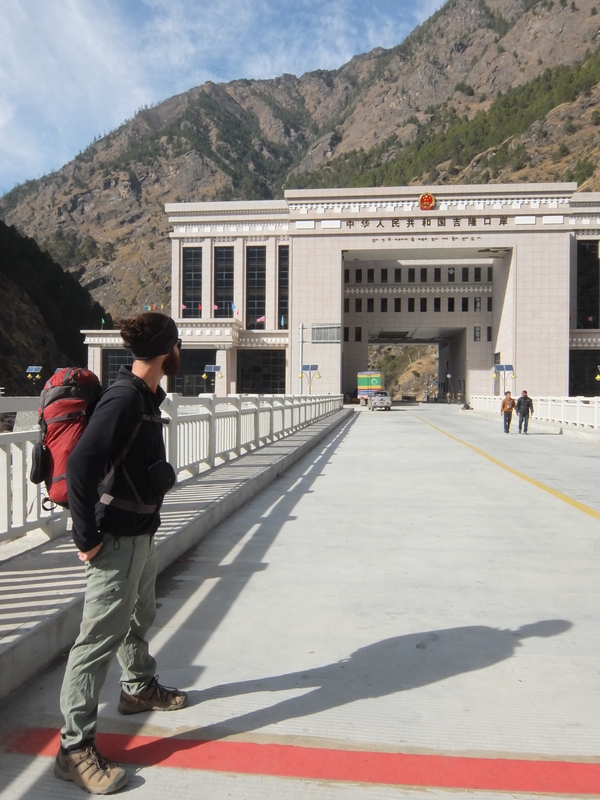 At the border the Nepalese side will allow you to step over the red line distinguishing the two countries. However, be wary of taking too many steps across, the Chinese military stationed on the other side are quick to bear arms! From this point I’d recommend trying to hitchhike the 10-18km back to Syabrubesi, almost any motorcycle rider will take you for a fee of 300rp. This cuts a potential 3-hour walk down a plain road into a 20-minute thrilling ride. 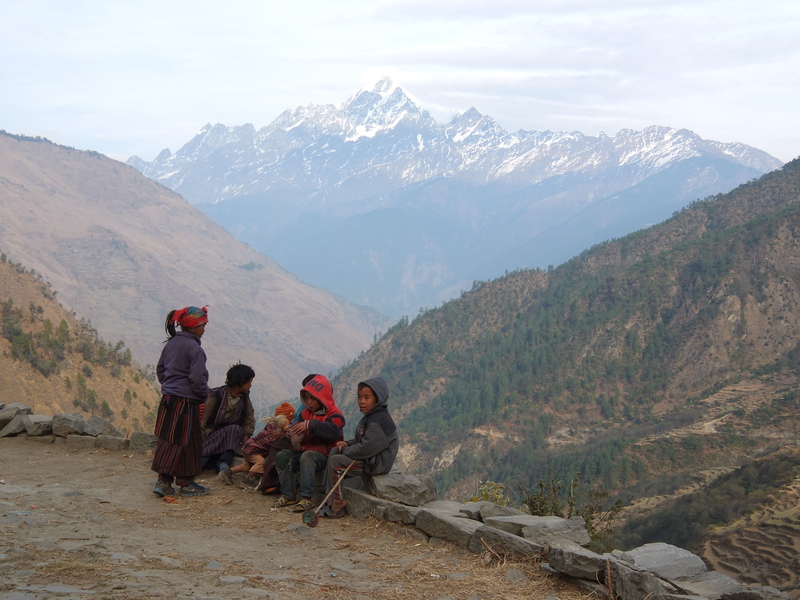 Ending your day back in ‘Besi’ is a nice way to relax, wind down from the trek and prepare for your next adventure. ← Tuesdays Travel Tip – Pack Light, Travel Easy. Hi, what month did you trek this trail in? Thanks! Hey Darcy, we did this hike in January/February. Which is technically the off-season since its winter there – harder to predict snowfall amounts and if major passes will be blocked etc.